Michie's Annotated Code of Maryland from LexisNexis is the reference set Maryland practitioners can rely on time after time for expertly annotated Maryland primary law. This set with the current cumulative supplement contains the authoritative statutory text and Michie's Maryland Rules, both meticulously annotated with Shepardized caselaw to guarantee accuracy and dependability, as well as law review articles and Attorney General Opinions. LexisNexis Maryland Code also includes a comprehensive index, tables of disposition and a transfer table. The Advance Code Service, published three times a year, provides updated statutes and the most current case law, while the cumulative supplement is published annually within 90 days of receiving all the legislature's acts. 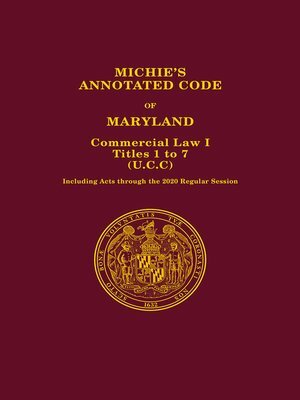 Get Michie's Annotated Code of Maryland today and assure your Maryland clients that your research starts with the best and most current annotated primary law available.